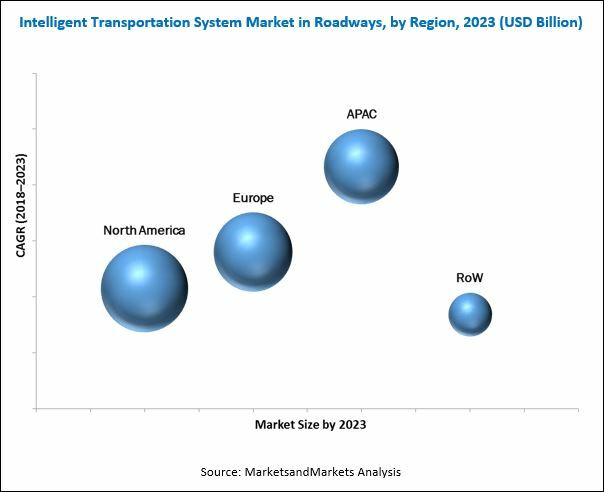 [189 Pages Report] The intelligent transportation system (ITS) market in roadways was valued at USD 21.88 Billion in 2017 and is expected to be worth USD 30.74 Billion by 2023, growing at a CAGR of 5.65% during the forecast period. The base year considered for this report is 2017, and the forecast period for the market has been considered between 2018 and 2023. 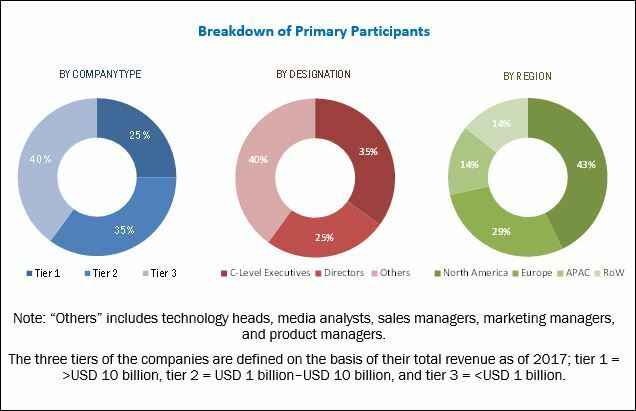 The objective of this report is to define, describe, and forecast the market size and growth potential of the ITS market in roadways across different segments such as offering, system, application, and geography. It includes the forecast of the market size, in terms of value, with respect to 4 regions North America, Europe, APAC, and RoW. The study identifies and analyzes the market dynamics such as drivers, restraints, opportunities, and challenges for the market. It also profiles the key players operating in the ITS market. The growth of this market is driven by the factors such as increasing concerns related to public safety, increasing traffic congestion problem, and favorable government initiatives for effective traffic management. The value chain of the overall ITS market includes various activities and factors that help achieve a high level of performance with respect to a service or a product. The key players operating across the value chain of the ITS market are Thales (France), Siemens (Germany), Garmin (Switzerland), Kapsch TrafficCom (Austria), TomTom (Netherlands), Cubic (US), Q-Free (Norway), EFKON (Austria), FLIR Systems (US), Denso (Japan), and so on. According to the MarketsandMarkets forecast, intelligent transportation system (ITS) market in roadways is expected to be worth USD 23.35 Billion in 2018 and USD 30.74 Billion by 2023, growing at a CAGR of 5.65% between 2018 and 2023. The major drivers for the market include increasing concerns related to public safety, increasing traffic congestion problem, and favorable government initiatives for effective traffic management. The report covers the ITS market in roadways on the basis of offering, system, application, and geography. Hardware offering is expected to lead the overall ITS market in roadways. The large market size for hardware is owing to the implementation of numerous heterogeneous devices, including cameras, sensors, intelligent traffic management systems, and advanced traveler information systems across the ITS infrastructure of any region. In addition, these high-end systems are synchronized to respond in real time; hence, these are likely to need frequent software updates, thereby increasing the operational cost. The market for commercial vehicle operation (CVO) systems is expected to grow at the highest CAGR during the forecast period. The increasing demand for the expansion of transportation networks and growth in the logistics sector are the key reasons for the growth of the commercial vehicle operation system market. On the basis of application, the intelligent traffic control application held the largest share in 2017. This involves a much closer interaction between all of its constituents: drivers, pedestrians, public transportation, and traffic management systems. Adaptive signal systems, driver advisory and route planning, and automated vehicles are some of the goals set up to increase the efficiency of actual systems. The intelligent transportation system market is largely dominated by North America and Europe because of the strong presence of key players offering ITS products in these regions. North America held the largest share of the global ITS market in 2017, while APAC is the most promising region for the ITS market, and the market in APAC is expected to witness the highest CAGR because of the increasing number of megacities and the growing population in developed and developing countries. Achieving interoperable and standard ITS architecture may appear as a challenge for manufacturers in ITS market. The major vendors in ITS Thales (France), Siemens (Germany), Garmin (Switzerland), Kapsch TrafficCom (Austria), TomTom (Netherlands), Cubic (US), Q-Free (Norway), EFKON (Austria), FLIR Systems (US), Denso (Japan), and so on. These players adopted various strategies such as product launches and developments, contracts, acquisitions, partnerships, and business expansions to cater to the needs of the market. *Details on Business Overview, Products and Solutions & Services Offered, Recent Developments, SWOT Analysis, and MnM View Might Not Be Captured in Case of Unlisted Companies.